The debut will be a little later than hoped, but this cover is ab fab. Early access will be given to Patron members, with Kindle, et al publication to follow. Have you read any books by the delightful Julie Johnstone? Good news! She has a free book for you today! Did you hear the news? SAVING PERSEPHONE WILL HIT THE STREETS MAY 31, 2015! Thanks to everyone for your patience as I’ve worked on this book. It has been a hard one to write and life, alas, kept getting in the way. I will be available for some blog touring and will kick it off on Friday, May 29th at Buried Under Romance. There will be a giveaway and everything! If you would like for me to visit your blog – which can be an interview, excerpt, giveaway, whatever – just drop a comment here or an email to suetours@graythorn.com. Somewhere in all that I will be giving away 25 limited edition book announcements (pic at left). Thanks again everybody!! 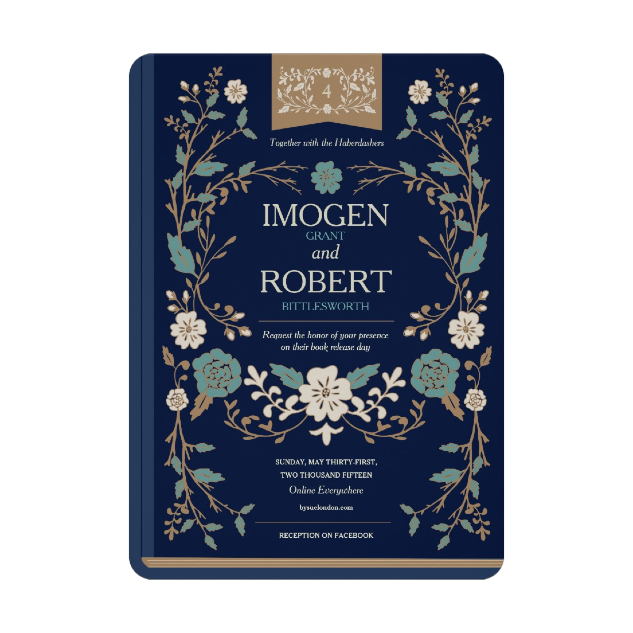 Now I just have to hope that you love Robert and Imogen as much as I do. Check out the excerpt below. When Imogen finally did receive correspondence from a Bittlesworth, it wasn’t from the one she wanted. This one now went by Telford. “What is it?” Violetta asked, on pins and needles. As far as her cousin was concerned, Imogen was being ignored by the duchess that only weeks ago had been treating her with favor. Little did Vi know, but the first and only time Imogen had spoken to the girl they had been ghastly rude to one another. But was this note actually from the duchess, or did Robert hope to steal her away for an afternoon? Neither idea filled her with delight, but both made her curious. Regardless, she would be gone in another week. She penned her acceptance. Inspired by the RT “Reader, I Married Him” interviews, this Valentine’s you can hear from MISTER London. Valentine’s Day is actually his favorite holiday. He wants to dress up in his Knightly armor to hand out roses. How did you guys meet? Was it love at first sight? We met while working together at a Mexican Restaurant. Sue was a new hostess. It was all hot salsa from there! Ok, I would be remiss to say that it love at first site, despite being the husband of a romance author. Sue triple-seated my station and I rushed to the hostess desk to take issue. I found a lovely, engaging, and strong young woman behind the desk. I could not grumble at someone new, so I told her that it ‘threw me in the weeds’. It was days later when I spied her in the bar reading Beowulf, that my Grendel of a heart was slain. THEN I was in love! Beauty, brains, and the ability to be a bit of a beast when times called for it. Sue is no damsel in distress, but a warrior queen to be slay dragons with. How long were you together before she became a romance author? Or was she already publishing when you met? Sue and I had been together for 24 years before she turned her quill to romance. Sue was always a closet author, though sadly unpublished. She delighted in writing; each of her tales were so entrancing that it became more and more difficult to read her work. She would often write a snippet of a story (paragraphs, chapters, etc.) whose characters were fun and engaging. And inevitably, the story would end as her attention wandered, often mid-sentence. This would leave me in a maddening and frustrated limbo of ‘what happens next’? I was a little surprised at the genre she decided to publish, but knew that even if it had been a research paper about glue drying rates, it would be still be a fun romp. As a romantic at heart, I have enjoyed reading her stories and reveled in sometimes knowing what will happen before it hits the keyboard. So tell us the truth – are you the hero of all of her books? Sue’s characters are so multidimensional that it would be hard to say that I am Gideon, Quince, etc. Each has a distinct personality and suite of strengths and vices that none would be adequate doppelgangers. However, as I read each of her works, I find aspects of myself in several of the male protagonists. I would love to say that all their virtues are mine, but I have often seen them wrestle with personal foibles that I recognize. Granted, I have never been a Lord Lucifer (or his costumed imitator), but there are moments of spontaneity and righteous outbursts that seem to hit close to home. Are you a fan of your wife’s novels? If we exclude all the books that to date remain incomplete, then yes. I am a huge fan. I have truly appreciated Sue’s ability to craft characters with depth and ‘souls’ that invite you to know them. I am struck by her instinct and desire to add a reasonably accurate historical backdrop rather than placing her characters in a fantasy vision of what once might have been. I find that my appreciation for the Regency period, which I knew more by date rage than content, has been piqued as she weaves her tales through real events. I also enjoy reading about women (the Haberdashers) who have a palpable and plausible strength, as opposed to the common shrinking violets in many period texts. Sue delights in researching and regaling me with the stories of the many incredible women such as Joanna Żubr, Lady Stanhope, and Jane Townsend who are often forgotten in history texts. I have to be honest in saying that I enjoy her sweetheart novellas (Haberdasher Tales) the most. Are you a writer? What kind of books would you publish if you could? I have written, but have not published anything more than scientific articles and academic papers. I have the mind of a storyteller, but currently lack the desire to become an author. Sue often suggests that I should scribe some of my many ideas, perhaps so I can stop bothering her with, “I have an idea for a story (books, series, etc.)”. They range from popular fiction, fantasy, sci-fi, and horror genres. That being said, I would find it hard not to incorporate romance in any story I write, as I have always been a romantic by nature. I have been lucky enough to enjoy friendship, partnership, and love with Sue for many years. I cannot imagine a true hero that should not enjoy the same reward. If you wrote a romance book, what would it be called? What’s the best part of having a romance author for a wife? Honestly, the best part has been experiencing Sue’s joy in attaining a life-time dream of becoming a published author. I love the twinkle in her eyes, the quickening of her conversation when she shares her latest ideas, and her appreciation for her readers. It is also great fun to talk through emerging plots as they are being dreamt when we travel to and from work or just sharing quiet moments. Jack, Sabre, and George have become my sister-in-laws, and I have to confess that I can’t wait to find out about Robert Bittlesworth and his romance with Imogen. I keep getting snippets of conversation and glimpses of developing romance. It is like peeking in the window of the Home Office, and knowing Robert, I keep waiting for the touch of a black powder pistol between my shoulder-blades for spying. Despite the danger, I want to know more! What is the biggest challenge in having a romance author as a partner? The hardest part is watching Sue struggle to balance a full-time position and a new career in writing. She has such a thirst to write and a desire to engage her readers. She spends a lot of her time trying to balance these demands. 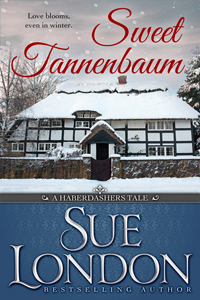 Sue has done an amazing job in self-publishing, an avenue that I was originally averse to. I argued that her work would be very palatable to publishing companies, but Sue likes to do things on her own (how Haberdasher). Sue is ingenious, creative, and thoughtful about her work and loves her readers. When she receives critiques, as all artists do, she is amazingly balanced and thoughtful. Rarely has she tiraded about someone’s opinions on her work. It is hard as a husband not to want to get online at times and allow the incensed Gideon inside me to take someone to task. Thanks for being on the blog today, Mr. London! Readers, want to win a free copy of Fortune Said, Sue’s Valentine novella, for yourself or a friend? Comment to tell us about your Mister/Miss (or Dream Mister/Miss) and Sue will randomly select up to three entries for a free copy of the ebook. In celebration of Sweet Tannenbaum coming out soon, here’s a lovely rendition of O Tannenbaum. And a sneak peek at the cover of this year’s novella. So what story do I have in the collection? Lord Lucifer’s Disciple. You may remember awkward, shy John Howards from Fates for Apate. What sort of scandalous summer nights could John get up to? You might be surprised. Trials of Artemis, Haberdashers Book One is available on Kindle.